It's competition time, folks! We've teamed up with Gigabyte Aorus for our latest giveaway, and we have quite the selection of goodies. 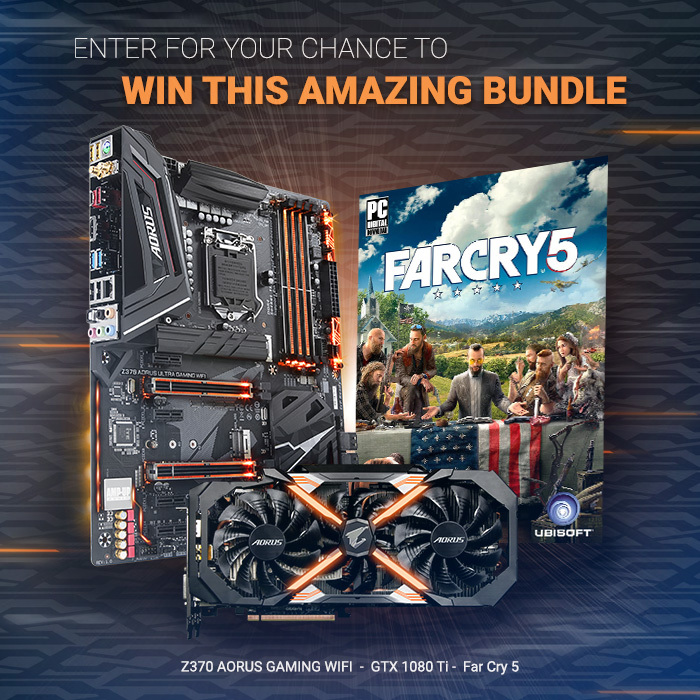 One lucky winner will soon be enjoying an eye-catching Z370 Aorus Gaming WiFi motherboard, a mighty Aorus GeForce GTX 1080 Ti 11G graphics card, and a digital download of Far Cry 5 for PC! An amazing bundle, we're sure you'll agree, and we're giving it away for free! Want to be in with a chance of winning? Simply answer the following question to enter our prize draw, and don't forget, you can also claim a second entry via Facebook. Thank you for taking part and good luck! Need a clue? You'll find the correct answer at aorus.com. The prize draw is open to HEXUS readers in the UK and Europe aged 12 years or over. The competition winner will be picked at random from all eligible entries that arrive by 22:00 London time on the closing date, August 3, 2018. The winners will be notified via email by August 10, 2018. The winner must claim their prize within 7 days of the promoter sending notification. If the prize is unclaimed after this time, HEXUS reserves the right to offer the unclaimed prize to a substitute winner selected in accordance with these rules. The prize is a Z370 Aorus Gaming WiFi motherboard, an Aorus GeForce GTX 1080 Ti 11G graphics card, and a digital download of Far Cry 5 for PC. Seconded, looks like a great prize. Another great comp from Hexus! Thanks Hexus, entered - Fingers crossed!